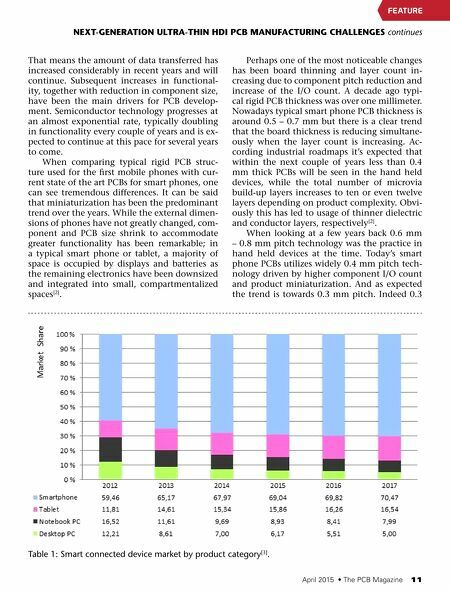 10 The PCB Magazine • April 2015 resistance to leakage) accelerate, and increas- ing signal routing density below the 40 micron line width threshold where conventional sub- tractive technology fails and additive technol- ogy remains too costly and small in production scale to be a practical alternative. While the increased use of sophisticated and adaptable automation such as laser direct imag- ing (LDI), sub 100 micron laser vias (LDD) and increased use of vision technology offer some improvements, escalating cost and hard limits in material performance suggest we need to fo- cus on the fundamentals to make the system more robust, capable and affordable. 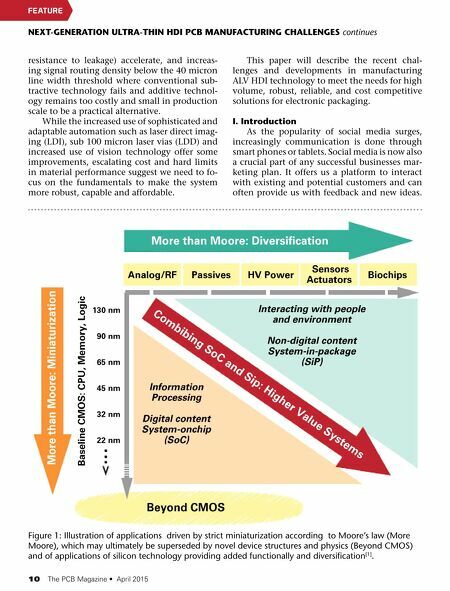 This paper will describe the recent chal- lenges and developments in manufacturing ALV HDI technology to meet the needs for high volume, robust, reliable, and cost competitive solutions for electronic packaging. I. Introduction As the popularity of social media surges, increasingly communication is done through smart phones or tablets. Social media is now also a crucial part of any successful businesses mar- keting plan. It offers us a platform to interact with existing and potential customers and can often provide us with feedback and new ideas. FeAture NExT-GENERATION ULTRA-THIN HDI PCB MANUFACTURING CHALLENGES continues Figure 1: Illustration of applications driven by strict miniaturization according to Moore's law (More Moore), which may ultimately be superseded by novel device structures and physics (Beyond CMoS) and of applications of silicon technology providing added functionally and diversification  .